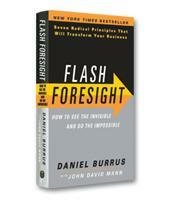 From small businesses to multinationals, individual careers to entire industries, Flash Foresight looks at how Daniel Burrus's seven radical flash foresight "triggers" have transformed dozens of careers, fortunes, and lives. Flash Foresight provides an easy-to-implement blueprint for applying the same strategies to your own business, enabling you to see the invisible and do the impossible. Today, as the pace of technological change accelerates almost beyond the point of comprehension, Flash Foresight is an imperative. How seven valuable principles can help you find deep business insights. How to change the way you think about your current obstacles and open your mind to limitless new opportunities. How to stimulate innovation and positive change. What you need to do to survive and thrive in the challenging times that lie ahead.